So nice of you to visit year after year! Thank you! Thank you! Everything was excellent except for master bedroom mattress. It was very uncomfortable. The living room sofa and chairs are extremely uncomfortable and look a little worn. Other than this everything else was excellent. It’s well kept and very clean. Our family has been coming to Palm Island for the summer for the last 7 years. We love it. While we didn’t get to enjoy the beach this year due to the red tide we still enjoyed our stay very much. We have been coming to Palm Island for eight years now and don't plan on stopping. My husband and I just love it there. It is so quiet and relaxing just what vacations are supposed to be. The gulf is beautiful and the beach so much fun to explore and walk along the wonderful white sands. I recommend it highly to anyone. The staff is amazing. The restaurant has wonderful food . What more could you ask for ??? Not a thing. Fabulous. My wife's birthday was made so much better by the view and amenities and decor of this condo. We will be back for sure. This get-a-way was our best yet at Palm Island. Between the miraculous weather which had the most sunshine we've seen in a month or so (we are from Tampa Bay Area) and the fantastic Palm Island Hospitality Staff which we've grown so used to by now that we fear starting to take them for granted. it was very enjoyable and the room was clean and nice furniture. The only issue was the TV in the master bedroom did not work and message on TV said to call Comcast cable to activate the account. We have been returning to Palm Island Resort for 30+ years. Now, our children are bringing their children to this slice or paradise. It is still a wonderful experience for kids, parents and grandparents. Our concern is the lack of larger units for rent. We had to rent three beach front condos which created a few problems. We have rented homes for our family's to enjoy each other and an opportunity to play with our grandchildren all under one roof. Some units are in need of upgrading. The rates charged to guests are no longer reflective of the highuality we have grown accustomed. The grounds, landscaping and maintenance is very impressive. We will return, as we alway do, just a little more cautious than in the past. A fine weekend at the beach! Palm Island Resort certainly met and exceeded our expectations.Friendly and very helpful professional staff along with a rental villa that appeared to have been virtually new. It was fully equipped along with a great screened porch and expansive views of the Gulf. Miles of beach to enjoy with a 2 minute walk just across the dunes. Great shark tooth finds. No cars only golf carts is a real plus. Would be hard to improve on the vacation experience at Palm Island Resort! Another wonderful time at Palm Island resort !! As usual the condo was fabulous and the weather couldn't have been better for our 15 day stay. As usual, our stay was a welcome and pleasant one. However, we did knot enjoy the particular unit that we were assigned to. The TV's didn't work in the guest bedroom and the beds need to be replaced-very uncomfortable. My wife, myself and our granddaughter spent a very nice 5 days with you recently. We've been many times before. The unit was perfect, the pool was heated, the hot tub just the right temp, the staff helpful. We'll be back. The Villa was an updated unit with everything that you need to relax with Family and friends. We can't wait to return. Great time at resort.Enjoyed the condo and the beach.Will come back again soon. What a great time for my wife and our 6 year old granddaughter. The staff was helpful, the unit was great. The pool and spa were in great shape. We'll do it again next year. Palm Island Resort is the perfect vacation getaway for families, couples, weddings, fishing, boating and more. The food is great and the villas are lovely. The beach is magnificent. Plus, the employees are so helpful and go above and beyond to make it a great experience. We had a nice, quiet relaxing week at the resort. Great food at the "sister " restaurants, quiet beaches. Nice accommodations, GREAT staff and personnel. Absolutely perfect vacation rental. Very accommodating and well equipped unit. Palm Island Resort was beautiful and the staff was exceptional. Highly recommend this vacation spot but only if you love the beach in it's natural state along with no cars, stores, noise and crowds. Look forward to coming back soon. Palm Island Resort is the perfect vacation spot. We couldn't have asked for a better vacation, - very relaxing and peaceful. I have been coming to Palm Island Resort since 1993, and each time seems to be just perfect. We love the laid back nature of Palm Island and the fact that it is so unspoilt in every way. It really is a magical place where time stands still and where we always enjoy wonderful family holidays. We had a wonderful reunion and stay at Palm Island Resort. The staff were courteous, enthusiastic and professional. Our unit was spotless and completely equipped - it felt luxurious. We were taken care of very well. Thank you to all who made it happen! Been coming here off and on for years with and without kids. VERY relaxing, beautiful location, unspoiled, special. Only issue is cost of golf carts, which are needed if you want to get around a lot. Cost per night is pretty high as well. We had an amazing time again this year on beautiful Palm Island. We came to the resort for a wedding and really enjoyed our experience. Condo was great, people were great, beaches were great!! 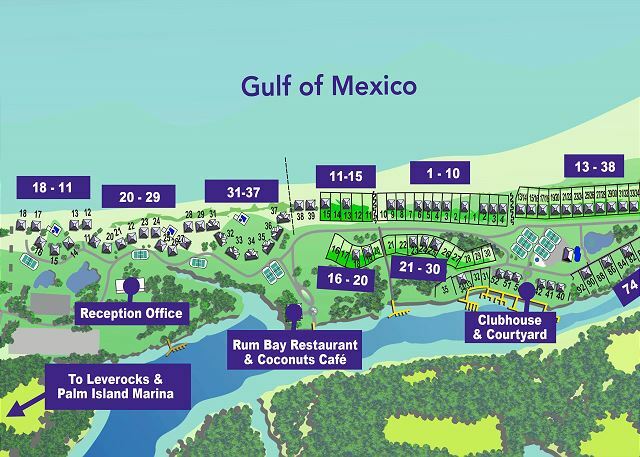 The only thing I would change would be to add 1 additional restaurant to the resort and put it on the beach. The restaurant that's there is very good, but having only 1 place to go for lunch and dinner on the resort gets a little old. Been coming to Palm Island for years. The perfect, relaxing vacation. This was our third - but not our last - stay at Palm Island Resort and we were once again thrilled with the experience! We encourage anyone of any age, with or without children, to stay at this resort to help to remember the important things in life: family and sanity. We absolutely love going to Palm Island Resort. It is a true get away. We have been going to the resort almost every year for the past 17 years. The staff are always pleasant. Some of the condos could use a little updating, but in general they are always very comfortable and meet our needs. The accomodation was very good except for the air conditioning which did not seem to work very well,it culminated in an alarm going off at 1am on the last day of our stay.Everything else was very good and peaceful a marked contrast to the hectic schedule that preceded the visit. The villa was lovely and had everything we needed. Excellent location on the beach. Wish the resort itself had a convenience store - offering more than what is offered at Rum Bay or Coconuts. This is the fifth year we have come to Palm Island resort,and not the last for sure. We have fallen in love with the condo we stay in and the resort and island. The people are so very friendly and there is fun to be had there. The gulf and beach offer so much. We recommend it highly. Quiet, relaxing, scenic my family loved the resort. The island was beautiful with lots of shells. We played tennis, explored the island and went swimming in crystal clear water. We really enjoyed this unit. It was bright, cheerful, and comfortable. Like all the beach villas in Palm Island Resort, the beach was just a short walk out the back door, and the restaurant and other amenities were convenient and close. We will certainly stay here again. Very nice staff. Cleaned up a wine spill without an extra charge. This is the fourth year we have stayed at your resort and it is always wonderful there. The staff is so helpful and nice always smiling. We will be back next year !!! We had 5 days and 4 nights at the Palm Island Resort and we loved everything about it. Our unit was clean and bright and very comfortable. Great time! Lots of shark teeth! Gorgeous, Remote & Quiet Getaway! The villa was beautiful. Very nice decor. Extremely clean. Absolutely beautiful view. Amazing deck. The only thing we did not like were the beds. Particularly the master bed (king bed). It was very uncomfortable like a giant marshmallow. Way too soft. One of the ladies at the front desk seemed slighly uninformed about detailed information we were asking about the location, geography, our villa, our stay, etc. However the other lady that was there w/ her (I believe her name was Marty???) was extremely helpful. She even upgraded us to a nicer villa w/o hardly even being asked. The other lady was very nice but I just got the impression she was a bit new & needed some more experience behind the desk. We did eat at Rum Bay for dinner. It was pretty good overall. It was very nice that there was a restaurant option on the island so that we did not have to take the ferry over for dinner. We were all tired & it was late. Also nice that there's a bar & coffee place there too. We absolutely loved the beach there particularly the shark's teeth & shelling. We don't get that in the Tampa Bay area so that was a real treat. We were there in December but we'd love to come back in summer so that we could swim there. Our party all agreed that we'd love to come back for maybe 3-4 days & play when the water is warm. Maybe a bit too remote for an entire week for our group but we absolutely had a fantastic time overall for our one night getaway & we loved it. It was just what the doctor ordered! Palm Island is certainly one of Florida's best kept secrets. This lovely island provides a haven for tranquil and relaxing breaks. We were lucky enough to see Dolphins most days, Ospreys, a Black Racer Snake, Tortoises and some lovely sea birdse. We can't wait to come back again next year. Just another few days in paradise. We have stayed at Palm Island numerous times, and we have always enjoyed ourselves. We we're a tad disappointed with our villa once we arrived. One shower had no hot water, forcing us and the other couple that was with us to use the same bathroom. Also the bed in one of the rooms collapsed when my wife, who is very petite, sat on it. Maintenance did fix the bed and the hot water by the next morning and the rest of the stay was wonderful. We look forward to coming back in the future. We didn't have coffee filters, not enough trash bags and we tried to close the blinds at night for sake of the sea turtles, but they are in "bad" shape and wouldn't close properly. We had a wonderful weekend and plan to make this a Memorial Day tradition. Kids had a great time!!! Great memories!! My children (ages 3 and 6) and I spent one week on your beautiful island in March of 2011, and had a lovely time. From the beach, to the pool, to the playgrounds, we just had a blast. We relaxed and really couldn't have asked for a better vacation. Everyone from the registration desk, to the staff at Coconuts, was great, friendly and helpful. We hope to be coming back soon!! We especially like the beach villas and 2913 is a perfect location. Over the years the units have greatly improved in the maintenance and kitchen equipment. We spent all our time on the beach. This was our first visit in January. Since we are Minnesota snowbirds living in Arizona for the winter the highlight of our week there was the beach. We hope/plan to return! January was a perfect time. Great sea shells and sharks teeth!! Had a great time. All the ladies in the reception area most helpful, Susan helped online before the trip and was great. The tennis pro, Bill, was fabulous as he was last year! He's pretty much the reason we came back. Great time as always at Palm Island. Unfortunately, ended up in a condo beneath kids who played loud music during the day. First time this has happened to us and was kind of annoying. Otherwise had nice accomodations despite no trash bags or bowls. Very nice staff. Great beaches. Didn't seem crowded despite Spring Break week. Another wonderful stay at Palm Island Resort !!! We love it there the property is so nice and the view wonderful-it was a little chilly but found lots to do as always.The Rum Bay restaurant is fantastic will come back again. Our guest and dog will too !!!!!!!! We live in Tampa, FL and have chosen Palm Island as our family get-away for the past few years. We have been on many tropical vacations and Palm Island provides the atmosphere,tranquility and ammenities that keep us coming back. We look forward to our next visit!